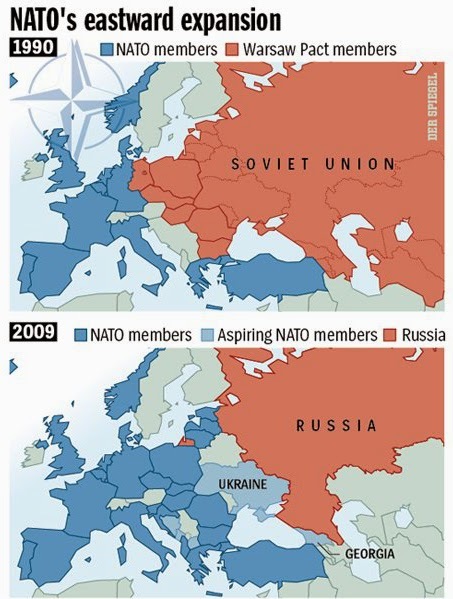 Image: NATO expands. Who is the aggressor? The Western media has attempted to sidestep this inconvenient chapter in history and paper over what is an overt repeat of the so-called "Orange Revolution" but with the addition of snipers and mystery gunmen sowing violence alongside battalions of literal Neo-Nazi militants, armed and clamoring to back Ukraine's integration into the EU and eventually NATO. The constitution of the opposition that has since seized power and is occupying the Ukrainian capital city of Kiev, is a mixture of bigots, racists, Neo-Nazis, and anti-Semites - all bent in eager capitulation to Western interests including the IMF's desire to impose crippling austerity upon the population. It was no surprise then that the majority of Ukraine's diverse population, which includes Russian-speakers, Jews, and other minorities, quickly rose up against the unelected regime. Despite the West's best attempts to bolster the legitimacy of the regime, including visits from both the US Vice President himself and the CIA director, the uprisings have spread and intensified.